My breed is Kuvasz......... 1993 was the first time I had heard of the Kuvasz breed, intelligent dog and is often described as having a clownish sense of humor which can last throughout their adolescence and into adulthood and it did. My Mom had seen a ad by a young girl going to school that had the puppies, instead of my Mom getting the puppy I did, we named her Kia and she was the start of my love for the breed, she would be become my soul dog, we had almost 16 years together and when I think of her the tears still fall even if it will be 4 years in December since I lost her. She was my Companion, she tended to her property and guarded my husband and let us know very quickly when her territory was challenged. Lacey lives up to her Kuvasz name well. she is very stubborn and we have had to do a lot of training. She guards her property and her home and family very well and does not like strangers in her yard. She is 16 months old, she is an intensely loyal yet patient pet, who appreciates attention but may also be somewhat aloof or independent especially to strangers. Lacey has her own Facebook Page and I use her photos to visit pages on Facebook with Children with Brian Tumors, and educate people that have no idea what a Kuvasz is. Kuvasz are not for every one. I been brought to tears many times dealing with Lacey but I not trade the love for anything!! We just got Apache she is 14 weeks old so we have 2 Kuvasz! Love my sweet nieces and her Mom for all what they are doing ! Apache looks so cute in his picture. 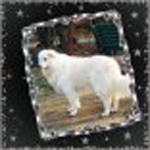 I see the breed Kuvasz first time in me life. You write so sincere and kind post thet it made me love this breed)) And I am so sad about Kia..